The Base or Root Chakra provides us with the essential characteristics to manifest not only our basic needs, but also our dreams and ideas. This Chakra is the grounding force that allows us to connect to the earth energies and empower our beings. This Chakra is associated with the element of Earth, governs the solid aspects of the body, such as the Bones, Teeth, Nails and Hair and also the Excretory System. The first of the seven main Chakras is the Base Chakra. Located at the base of the spine the Root or Base Chakra, together with the Earth Star Chakra and the feet chakras, form our foundations. The issues related to this Chakra are concerned with physical survival, grounding and connection with the Earth and our body. When this Chakra functions well, physical energy, good health, abundance and security are created. Relates to: Red, Earth, Physicality and the Etheric Body. Balancing this Chakra brings physical energy, good health, abundance and security. 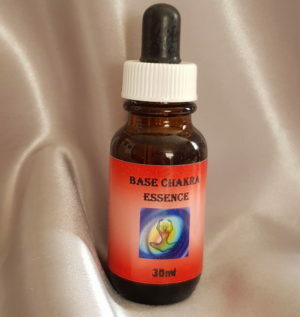 Chakra Essences are very hardy: however there are some precautions that should be taken to keep them at their best.